It seems that altcoins are exploding. Almost every other day you hear about a new coin that just came out which is “the best coin ever!!!“. For example, just the other day Kanye West published the Coinye West, his own crypto coin, DogeCoin was invented as a joke but then took to everyone’s amazement and now there’s even a service offering you to create your own crypto currency. Yes I was pretty shocked about that number as well (for reference the picture at the top of this post has 134 coins, I’ve checked…). I say “over 175” since there are 175 listed here and I know of at least 1 more that isn’t listed there. So although almost all of the coins are deflationary, an absurd situation has risen – If you can’t mine more coin, let’s just create a different coin. 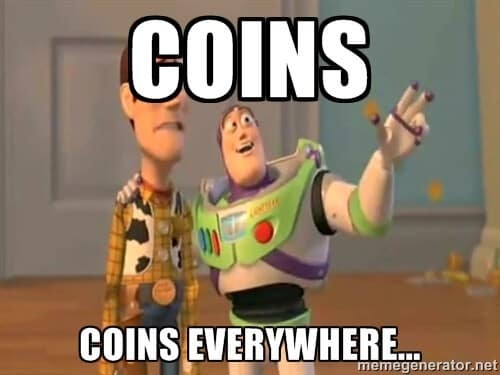 So in order to divide the wheat from the chaff so to speak, I decided to dig in a bit deeper into the world of altcoins. 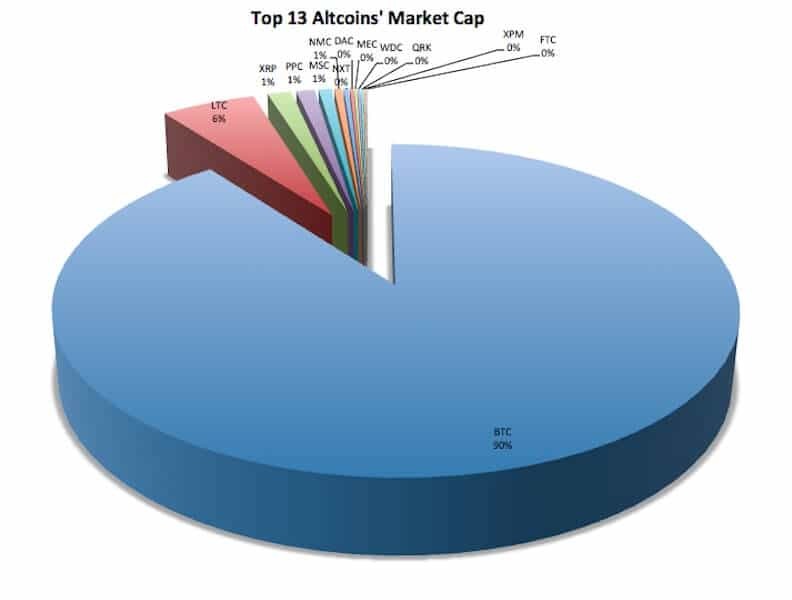 Examining information from CoinMarketCap.com I found out that only 12 other coins amount to at least 0.1% of Bitcoin’s total trading volume is USD, and only 3 amount to over 1% of Bitcoin’s total market cap. *Ripple information is estimated since I was not able to find the exact amount of XRP in circulation. What if there are coins that everyone is talk about but haven’t reached a sufficient market cap ? That might give us a head start if we start mining them sooner. So I did a little test and tried to figure out which coins are most talked about around the web. I started out naturally with Google Trends. Most of the coins I’ve measured against Bitcoin and Litecoin didn’t even manage to show up on the graph, except for Quark and DogeCoin. Quark is an altcoin that is considered more secure than Bitcoin, its mining is faster and it’s inflationary. Although DogeCoin did start out as a joke as mentioned before, today it’s market cap is somewhere around $5.5 million. So although these altcoins (DogeCoin and Quark) aren’t even close to Bitcoin they are giving Litecoin a hell of a fight in the social media for the past few days (data is from the past month), similar to what we see on Google Trends. Words are cheap, what about people’s actions ? Finally I decided to look which websites get the most traffic. I did this using Alexa – the web’s information company, they have a ranking for each website according to its traffic estimates. The results where quite confusing I must say. Of course first and second place belonged to Bitcoin and Litecoin. 3rd place belonged surprisingly enough to Feather coin. 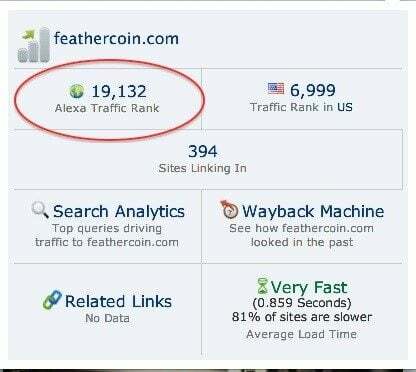 Feather coin is an altcoins which has Scrypt based hashing algorithm (I have no idea what that means….). In 4th place was Ripple and in 5th surprise surprise….DogeCoin! First of all, don’t go running after every new coin you hear about. It’s become somewhat of a fad to create new coins these days. Second, I may want to take a deeper look into Quark and FeatherCoin. 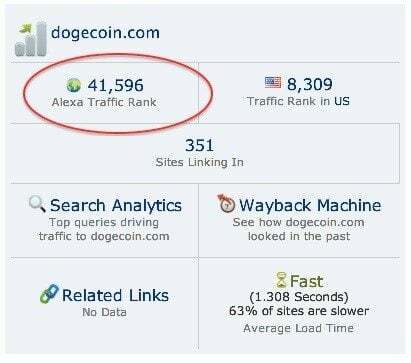 Regarding DogeCoin I’m a bit ambivalent, keep in mind that it’s only been around for a month and a half and there was a lot of buzz over it since it started out as a joke. The information given here doesn’t promise anything of course but hopefully it sorted out some of the mess regarding all of the coins out there.